Indoor playgrounds usually comes with play structures designed to be safe and fun and is a good place to go for play-dates or just on your own, especially when it is raining or way too hot to be outdoors. The kids get to expand their energy, play and practice their motor and social skills while parents get some rest. 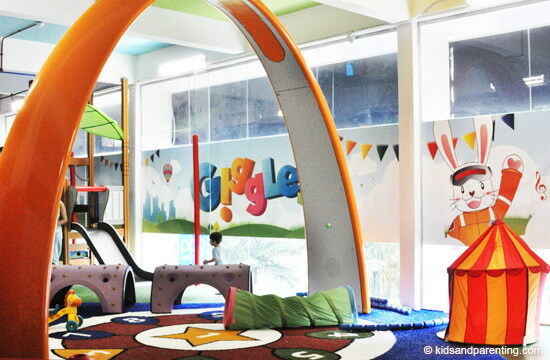 Check out the indoor playgrounds for children around Singapore. We have group them by locations: Featured :Central/South, North, East and West. You can also browse our searchable directory for indoor playgrounds & play clubs. With a jungle theme play gym, mini glow-in-the dark golf area and a space ball theme shoot out area, this indoor play centre is loads of fun. There is an indoor Bistrol so parents can relax while their kids play. The price is on the high side at $30 for two hours. (Updated 2018 : Playground Closed)Big with three huge structures challenging enough for the adventurous kids and areas designated for toddlers and babies under 2 years old. With a build in cafe and unlimited play for just $19, it is where parents can chill out and finally get to read a book and catch up with friends while the kids play. Bring your socks. They are really strict about that here. This playground aims to be a fun haven for kids, where they can play safely, explore freely and develop their sensory motor skills in the midst of having lots of fun. It comprise of a Pretend Play section, a Discovery Corner, an Interactive Play area and a Music Corner. Cost on weekend is S$25 for 1st 2 hours, S$8 for additional hour. FidgetsCity combines play, art and craft, Adult gets access to free Wifi and iPads. Cost on weekend is S$22 for 1st 2 hours, S$9 for additional hour. Alternatively, a play and craft package cost S$22for 1st 2 hours. Where: B1-57 The Shoppes at Marina Bay Sands, No 2 Bayfront Avenue, Singapore 018972. This place using a made in Japan play system is conveniently located at Vivo City. The pictures published from its website shows beautiful pastel swings, merry go round ball pools and slides. $18 for an hour of play and $10/hr there after during peak periods. This new addition to the Singapore indoor playground scene is right opposite Ikea Alexandra and cost just $10 for unlimited play. Structure looks interesting with a slide, ball pool and ample climbing opportunities. The Petite Park at City Square Mall provides children under 7 years old with an imaginative, challenging, and fun yet safe environment to play and explore. An active play space with slides, ball pool and merry-go-round style swings and a pretend play space with multiple stations such as train tracks, kitchen toys and food stalls. $18 for 2 hours of play on public holidays and weekends and $18 for unlimited playtime on week days. Tickle Tickle takes up the space that Atlantic city once occupy. This is a hybrid playground with a small activity center, ball pool and lots of interesting toys to engage the kids with. Its amazing how the small place is transform to look so bright and inviting and so many ways the kids can play together. Cost on Weekend is $14 for unlimited play. This huge playground in Toa Payoh offers lots of space for kids to run about. And it’s huge at 2,700 square foot. Rates and membership is the same as the Downtown east branch. For the AMK branch Ball’O’City is included in the play rates. This indoor playground boast some interesting and unique play equipments. There’s Sona an interactive playground system where kids can play games that helps them recognize numbers, learn to follow instructions, develop reactive thinking and have fun with dancing while building up social skills. There’s also a cooking corner with toys and courses parents can participate in while the kids play. Admission is $20 per hour for kids 3-12 years old, $12 for kids 1-2 and free for babies less than 1 year old. It is new and big and full of challenging and fun stuff especially for older kids. At 3 storey high it is easy to spend at least half a day in this vertical playground. Playful Elves have triple wave slides, ball shots as well as an indoor race track, inflatables and table toys. Usual price is $18 for members and $20 for non members for the first 2 hours. Where: 154 West Coast Road, #02-02 to 04, West Coast Plaza *Note: Pricing information are for reference only. We have selected weekend/public holiday pricing for most of the playgrounds as an indication. Most playgrounds have better rates for weekdays. Please refer to provider’s website for updated information. This is quite a small set up but it is generally not too crowded and the kids love it all the same. The price is hard to beat at $3.30 an hour if you get their play card. There is ice cream, snacks and drinks available and a sitting area for parents. 6 Dec 2014 – Add additional playground links. It looks like there is only one rate for kids below 12. For your info. Little o zone at OCC. is close. Thx for this list! Very helpful! Today we went to explorer kids at downtown east, pros: big and not crowded, unlimited playtime. Cons: very dark inside, very rundown and needs a serious facelift. thanks for compelling this! its very comprehensive.